160 pages, A4 sized with a card cover, there are many period black and white photos, maps and 44 pages of scale drawings. 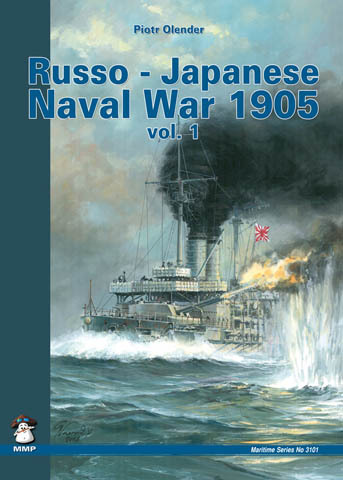 Covers the later stages of the war including Tsushima, profusely illustrated with photos, maps and drawings of all of the Russian ships involved from battleships to submarines. I think MMP has missed an opportunity to show some colour profiles or at least some 3 or 4 view plans of some of the more prominent ships. A must for naval enthusiasts and anyone interested in “turn of the century” naval history. The Russo-Japanese War and in particular the Battle of Tsushima were important as the first major conflict of the 20th Century, the first involving modern weapons and the first time the “modernized” Japanese flexed their muscles giving us an insight of things to come. This book by Mushroom Model Publications is the second on the subject. Vol. 1, by the same author, covers the early part of the conflict and ships of the Japanese fleet. The page and chapter counts of volume 2 carry on from volume 1 so this one begins with chapter 30 on page 160 through to chapter 55 on page 233 and the index on page 305. The first 15 chapters of vol. 2 concern the operations of various ships out of Vladivostok and Japan in and around the Sea of Japan between Russia, Korea and the Islands of Japan. With many period B&W photos of the units involved plus maps showing the various actions, this is just the prelude to the voyage of the II and III Pacific fleets from the Baltic Sea and culminating in the Battle of Tsushima. The final 13 chapters are about the build-up of these two strengthening fleets, their passage to the Sea of Japan via the Cape of Good Hope (II fleet) and Suez Canal (III fleet) including accidentally opening fire on the British fishing fleet due to poor communications, poor intelligence and panic. So it comes as no surprise, considering the distance the Russian ships had sailed, the poor leadership of their Admirals and the hodge-podge of ships, none of which would be considered first class and the mostly British built warships of the Japanese fleet, capably led with well trained crews, that the Japanese walked all over the Russians in a very quick and decisive victory that was the Battle of Tsushima. Over 18 pages, each stage of the battle is described, clearly showing the units of both protagonists in very clear maps with many period photos to illustrate the text. Chapters 54 (The End Of The War) and 55 (The Balance Of Loss) brings the main part of the book to an end. After Appendixes and Bibliography, there is the Russian Naval Scale Drawings. Over 44 pages, these are all starboard side waterline images, although with the larger ships the lower hull is indicated by broken lines, from battleships to submarines and everything in between. As noted above, the Japanese ships are covered in Vol. 1. An extensive index bring us to the end.